Want to challenge your view of what it means to be a person living in London? Then come on our alternative walking tour and discover one of the world’s most vibrant and paradoxical cities as you’ve never seen it before! Brought to you by Sock Mob Events in conjunction with the London Fringe Festival 2010,Unseen Tours provide a totally unique and exciting perspective on well-known landmarks and the lesser-known nooks and crannies of London. Led by homeless guides with their own distinctive styles and life histories, each walk will have its own personality as it uncovers London’s hidden history and present-day reality from their perspectives. The walks take place in two areas, London Bridge and Shoreditch, both containing powerful symbols of the city’s diversity and social change. These are tours with a social conscience, appealing to Londoners and visitors alike, and anyone who wants to connect with people from different walks of life. The tours take place from 6th – 30th August and will run every Wednesday-Sunday, starting at 7pm Weds-Fri and 4pm on Saturdays and Sundays. The London Bridge walk meets at the main Tooley Street exit outside London Bridge tube station (opposite the London Experience). The Shoreditch walk meets at Old Street tube station, above Exit 1. Walkers are advised to look out for our home made cardboard signs! The tours will also directly contribute to improving the quality of life of some of London’s most marginalised people. Tickets cost £5 and, in line with the principles of social enterprise, the lion’s share will go to the guides themselves, enabling them to make a living and improve their situations. All profits will be reinvested back into the enterprise to train more guides and continue to build their skills and creativity. The Sock Mob is an innovative, grassroots volunteer network engaging with homeless people in London, using the icebreaking power of socks and conversation to reconnect them with society. 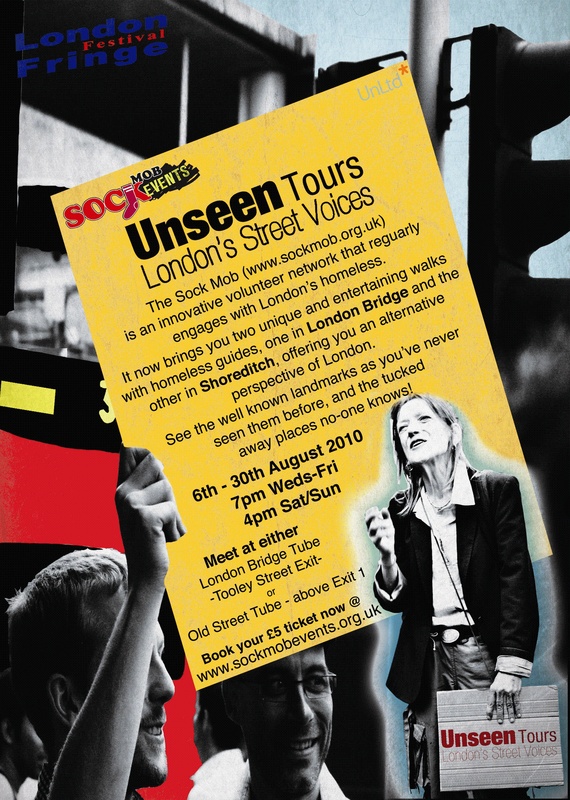 The Sock Mob’s spin-off social enterprise, Sock Mob Events (funded by Unltd, the foundation for social entrepreneurs), is now launching Unseen Tours: London’s Street Voices, featuring guided walks with a homeless guide as part of the London Fringe Festival 2010 .